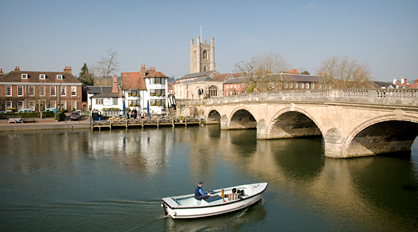 The Frog is 5 miles from the historic market town of Henley-On-Thames. Famous for its Royal Regatta at the beginning of July, it frequently hosts other music and art festivals throughout the summer months. Henley has some wonderful shopping facilities including various farmers’ markets in the town square from spring through to autumn. These can have a French, Italian or Local theme and are well worth a visit. The nearby village of Turville (2 miles) is famous for its windmill, which was central in the classic children’s film ‘Chitty Chitty Bang Bang’. A walk up to the windmill commands incredible views of the valley and shows just how beautiful and un-spoilt the countryside here is. 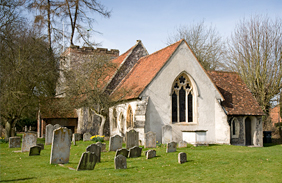 In addition, Turville is also well known for that most famous member of the clergy, ’The Vicar of Dibley’. The highly successful BBC television series was produced and filmed on location here and of course the 12th Century St. Mary’s church at Turville features heavily. Just 1 mile down the road is the village of Hambleden. The church of St. Peter and St. Paul is 11th Century with an 13th century façade and is well worth a visit. Film crews can often be spotted here in Hambleden too.